The brief? No boring square rooms. No two rooms the same. Balancing a range of challenging planning, heritage and site restrictions, the Naremburn House finds form through shifting volumes and geometries, playing with light, textures and materials to create a house underpinned by an ‘intentional irregularity’. 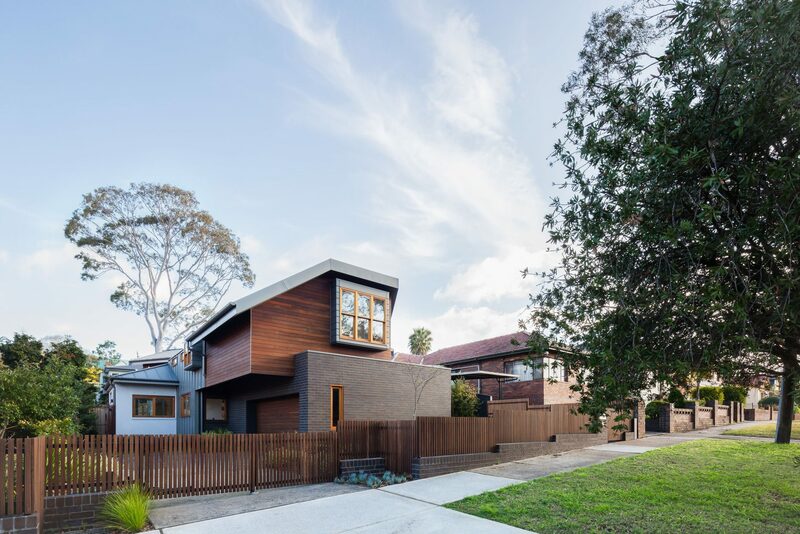 Re-interpreting the traditional roof forms of a Dutch gable and catslide roof allowed the Naremburn House a compact street presence in harmony with the neighbouring buildings. The resulting roof form also opened up volumetric opportunities internally for the dwelling floor plan. Asymmetry and subtle spatial manipulations help manage scale and proportion from the entry, through to the open living spaces, out to the swimming pool and garden, and upstairs to bedrooms and bathrooms. The interior centrepiece is dubbed the ‘De-Form Wall’, a sculptural installation rising two storeys through the central staircase. Designed in collaboration with parametric design specialists AR-MA, its script of finely routed linework is inspired by the local topography, offering dancing light and shadow plays throughout the space, day and night. The central stair void is just one of a series of finely tuned spaces that make up the Naremburn House, characterised by a sense of both delight and robustness.